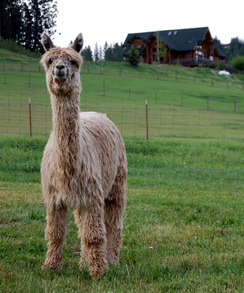 BIG TIMBER ALPACAS, LLC - Get great deals on alpacas in Openherd auction lots! Chakotah in 2011 had a son win four Judges Choice awards, (Pucara) Chakotah's Wyuna, and a daughter, Buzz n Hum Layla who won GWAS 2011 Judges Choice. Chakotah ALSO won the Nationals and GWAS Get classes with our Pucara Kahuna, his grandfather, in second both times. His cria won championships and ribbons in many shows all over the country. When we first started our alpaca farm here in the US the first sale we made of our own suris was to Ann and Bill Rogers at CCR Alpacas. We asked Ann and Bill if they would let us know when one of those girl's, Kalina, had her cria and we would consider purchasing it. As it turned out they decided to send Kalina along with several of our own females to be bred to Moon River's Durango, at our sincere urging!!! Jude and I adored Durango. He was a stand out in the show ring winning a championship in all his shows but more importantly to us he had exquisite genetics. Those breedings produced two national Champions for us and several ribbon winners. When Kalina gave birth Ann excitedly called us and raved about the cria. Well we know owners get a bit barn blind about their animals so we asked for pics....man oh man, he looked fabulous. 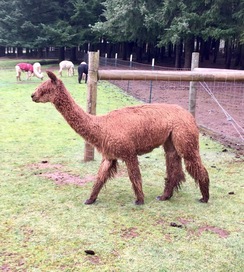 We visited CCR Alpacas soon thereafter and purchased a half share of this boy, Chakotah....at two months of age!!! It's insane, the first time we have been so bold but in the flesh he even looked better than the pics. The Kahuna daughter, Kalina, had produced a knockout cria. Wyuna's Cristal of PVA is a stunning beige female from the famous herdsire Chakota's Wyuna and dam, Chablis of PVA. Cristal is following in her famous parents footsteps. She won Best Head at the 2014 IAO show as a fourth generation winner on her dam's side. Her genetics are a who's who in the suri alpaca world: Wyuna, Chakotah, Kahuna, Durango, Balboa, Macgyver, Bruxo, Kobe, Mahogony Prince, Chablis, Syrah of PVA.